It’s a gorgeous, sunny morning, and I’m enjoying a hot cup of tea, while watching the sunrise through the glass French doors of our patio. It’s great to be home in our new place. As I mentioned in Part 1 of our story of settling into our new home, we made lots of changes around our new house to make it green, and to make it ours. After the kitchen, the next biggest project was switching to a tankless hot water heater. In our old rental, we were at the mercy of a very old, very small, conventional electric hot water heater. No amount of begging or pleading with the landlord could convince him to change that out, with something bigger and more efficient. So, that meant that every evening turned into a carefully orchestrated plan, as to who was going to bathe first, and when. What time do the dishes have to be done, to allow for the 30 minutes for the hot water to recover? Nope, can’t do laundry right now… Green Organic Girl has to take her bath. Then when you finally got into the shower, it was a mad rush to get finished, before the hot water suddenly ran out. It was totally unnecessary, daily aggravation, and wasted energy spent on that aging hot water heater. So, along with plans for a functional, modern kitchen, another must-have for our new home included a tankless hot water heater. Tankless hot water heaters are exactly what they sound like: there is no holding tank, and instead, the water is heated to a preset temperature as it passes through the unit. These units pass on tremendous energy savings, as they don’t sit there, warming water all day long, while everyone is at work/school, or asleep. When the computer inside the heater senses that a hot water faucet has been switched on, it sends a signal to the heating element. In the short trip the water takes through the unit, it instantly goes from cold to hot. Once running, the supply of hot water is virtually endless. Depending on the size of the unit, various other things can share in the hot water at the same time, without interrupting each other (i.e. run a sink, while someone showers, at the same time). During the whole time we were house-hunting, our plan was always to upgrade the electrical service, to accommodate an electric tankless hot water heater. In our area, most of the homes we were looking at, were built with 100 amps of service coming in. For the size of tankless hot water heater we were looking for, one that could accommodate two faucets running at the same time, we would definitely need to upgrade to at least 200 amps of service, in order to power one of these heaters. While these units do save on electricity, because they’re not running all day long when not needed, when they do run, they draw a lot of power. That’s a must, when the water needs to be heated an extra 60 to 70 degrees in an instant. It was shortly after we closed, when we were finalizing renovation plans with our contractor and electrician, that we were told just how much an electrical upgrade would cost: somewhere in the ballpark of $5,000. That’s just for the electrical upgrade; not including the heater and plumbing work (about another $1,000). Thankfully, that’s when our team of professionals suggested the slightly more affordable Plan B: going with gas. We are extremely happy with our decision to go tankless. We now have steady, on-demand hot water, and the added energy savings of not cooking a whole tank of hot water 24/7. 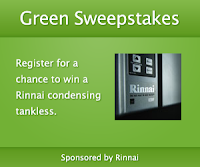 Hubby did do a lot of research, and spoke to a lot of professionals, before deciding on our Rinnai brand of tankless water heater. It’s one of the better ones out there, with a smart regulating computer inside, that knows just how many of its burners to fire up, depending on the water flow. That gives us peace of mind that not all the jets are burning, if a certain little one has just a trickle of water going, to wash her hands. We can also precisely set the temperature, using digital controls, so we know it definitely won’t come out scalding hot. Rinnai is Japanese-made, and it’s also the brand featured on HGTV. We love ours, and highly recommend it to our friends considering going tankless. Also, don't forget about the Federal Tax Credits running through December 31, 2010. We're taking advantage of 30% back on the installation of our tankless gas hot water heater. Click here to go to EnergyStar.gov for more info. No promotional consideration was paid for this post. This is a review of a personal purchase. Nice blog - thanks for putting all this great info out there!